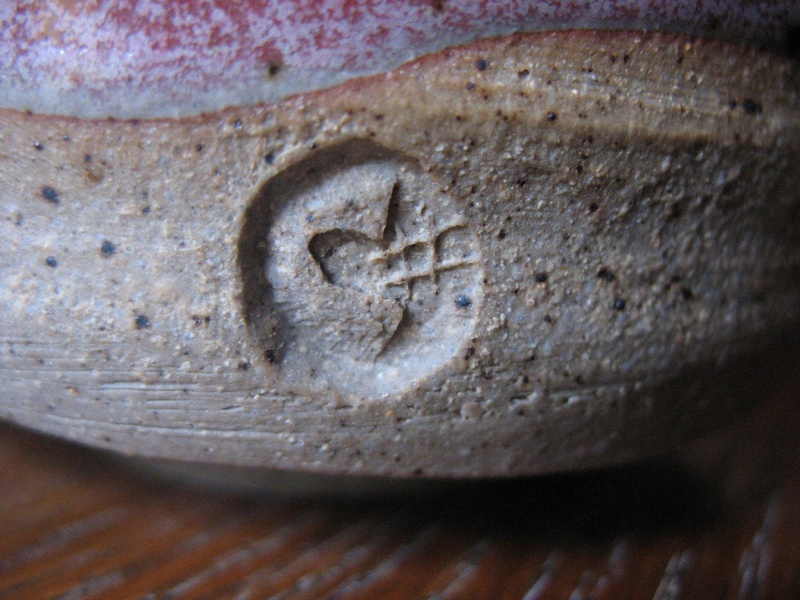 This photo is a close up of the ” C# ” I stamp into all my pots. This one happens to be on a drinking cup. Why C#? (pronounced C Sharp) My first name is Cameron so that’s the C. My last name is Sharp and in written music the ” # ” symbol means sharp. Whatever note has this symbol is played a half step up. I’m a musician and C# has been a nickname for a while among friends and other potters. I love to write songs and for some reason often write in the key of C#, which sonically is the same as D flat. I play guitar and love tuning it in Drop D, or what me and my band mates used to call drop D and a half, which simply means that we tuned our instruments down a half step on all the strings and then when we switch to drop D it ends up being D flat. Or C#. So the strings are tuned from the lowest to the highest as D flat, A flat, D flat, G flat, B flat, E flat. Along with some other tools, I made my stamp before I ever threw a pot. I knew I wanted one and did not like the look of names just scratched into clay. I had some Makore hardwood scraps from a cd corner cabinet I had made years before and thought it might be longer lasting than if I made a seal out of clay. Having been a woodworker for many years my medium at that time was wood, and even though I had not done much carving, I thought I would give it a go. I made 2 or 3 and this one turned out the best. Making them from clay is great because you can make them quickly and keep making them as they wear out. 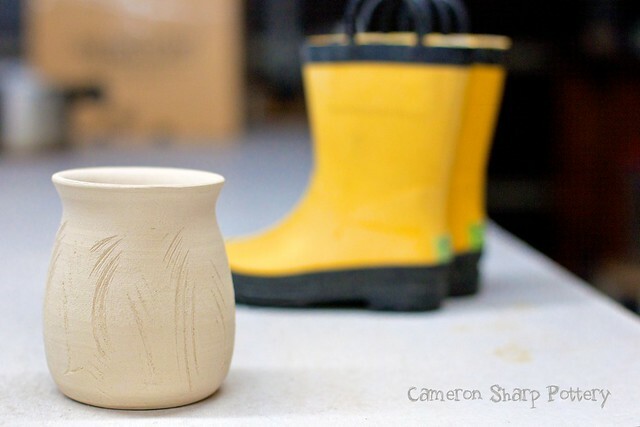 The clay is much easier to carve than wood. Simon Leach has some great videos on making seals you can check out on YouTube. I haven’t made any seals in clay yet but I would like to make some that say the name of my town or the country I live in or even the year. If for no other reason it would help me remember what was made when and where and help me follow my progress. We are casually considering new places to live and I would like to mark the pots made here differently than the ones that will be made in the new place. I like the way my stamp came out so much I was thinking of ways to recreate it in clay. I could use the wooden seal to make a mark in some soft porcelain clay, let it harden, even bisque fire it, and then use that as a mold to make another stamp. It would pick up the image in reverse and might just work. I’ll try it and write another post about it in the future. When I made these marks, I held the pot on my lap with a hand on the inside for support and with a firm grip on my tool pushed the blade down and at the same time slid it sideways towards me. This made the sweeping marks. On others I used it to make a straighter mark more like combing. Some I did from both directions. It was fun exploring what could happen. I did a lot last night from 9 pm until dawn when I heard our neighbor’s rooster crow. I pulled handles for jugs and mugs. I made a 2 pound bowl. I kneaded loads and loads of clay. I trimmed 6 cups and 3 made it 3 did not. I think my tools were dull so I must sharpen them before trimming next time. 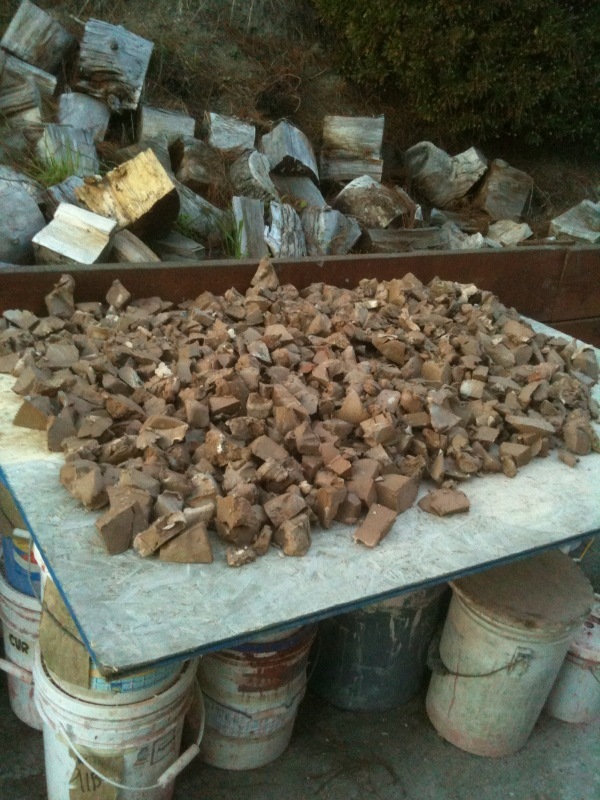 I had 6 balls at 1.75 pounds of some really stinky clay which I threw into shapes that did not make it. It did not hold up very well during throwing. The other clay I got from John at the Clay Studio seems denser and better to work with, plus it does not smell like a sewer or cow dung. It’s good practice finding out how hard to push and how far I could go and especially how far is too far. It’s also good practice letting go and not being tied to the outcome. I trimmed the lid I made the other day but it was too soft and did not make it. So, I made a new lid in a different style which will be easier to trim when the time comes and a real improvement in form over the last one. I used my sawz-all blades to decorate some texture into the 2 jugs and the mugs. I found a way to make a mark by dragging it 90 degrees and sliding it a little left or right at the same time which makes a progressively longer mark. 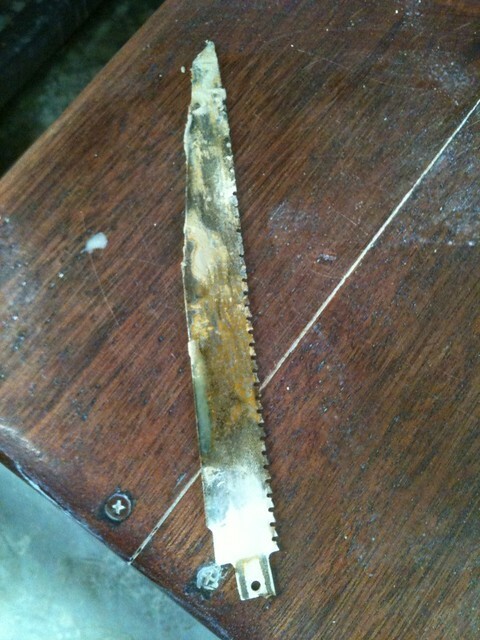 The sawzall blade is my new favorite tool. I love the result of the mark left when I just go for it without any hesitation, nice and fluid. Confident. Finally I put a bold and thick handle on the jugs. One of the jugs was still soft at the belly but not the rim. The rim provided good attachment but the belly caved in a little which made the join look sloppy and contrived. I tried to save it but it kept getting worse and worse so I let it go. I will make more. The jugs were 3.5 pounds of clay and could have been a little bigger and less thick in the base. I was unhappy with the shape of the big bowl I made the other day so I let that go as well by cutting off the rim and creating a whole new design. I like what it has become as a result. I figure it is like learning guitar. Slowly and correct will be the better path in the long run. My hands and wrists are sore today and my lower back is aching. I imagine I will get stronger as I practice and it will help heal my wrists. As long as I am mindful of how far I am pushing myself it will be ok. I do believe it is about technique and skill and not about physical strength. 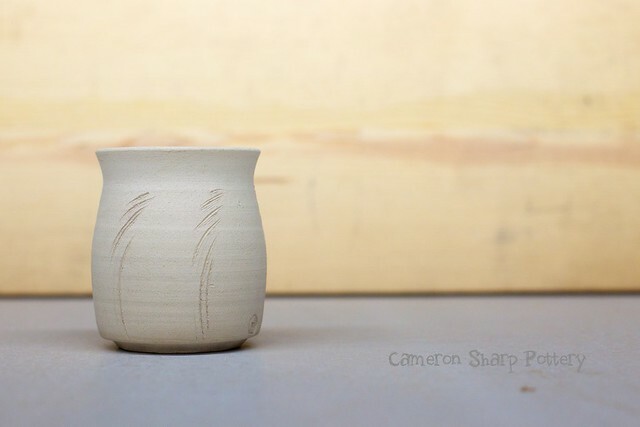 Centering large amounts of clay can be physical but it can also teach me patience. I’ve been resting for hours and I really want to go out there and check my clay. I think throwing more often for less time is better than one marathon session. However, during this middle of the night adventure time drifted away from my awareness. I was doing my thing totally immersed in the task at hand, learning and loving it with passion and momentum, when all of a sudden I heard the rooster crow, and thought, it must be time for a nice little cuppa. I cleaned up, made some earl grey tea, and greeted the sunrise with delight and gratitude. Another great short film from Goldmark Gallery! Well Done. Anne Mette Hjortshøj – Paying Honest Attention is so inspiring. These films all have such a great vibe about them. I watch them over and over and then go make pots. They calm me down and lift me up all at the same time. They give me something to aim for and affirm that I am on the right path. I feel an earthy connection to the potters featured in these intimate glimpses. I want to be this kind of potter making pots fired in a wood kiln, living this kind of life in the country, growing organic food, working outside in open space collecting materials locally to use in or on my pots, living a life inspired. I love the look of Anne Mette’s pots. The fluid nature of the clay in the lugs for the handles of her teapots, for example, look as if the clay is still soft and the handle has lifted it up in the center. The colors and patterns are fantastic. I like how she makes and uses stamps for adding patterns of texture for the glaze to run over or collect in or break over and edge. After seeing her beautiful pots and then watching the video it came as no surprise to me that she fires with wood. Most of my favorite potters fire with wood. There is nothing better in my opinion than a wood fired pot. There is so much going on with color and surface from the flames and ash and salt. You can look at a wood fired pot a hundred times and see something new each time. 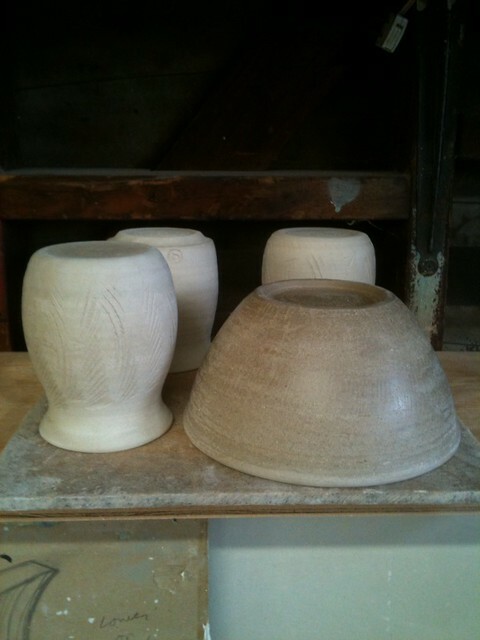 I love the way Anne Mette talks about making pots and the process of learning with Phil Rogers. It’s very clear she holds him in the highest regard. He is one of my favorite potters and an opportunity to learn and work with him would be a dream come true. 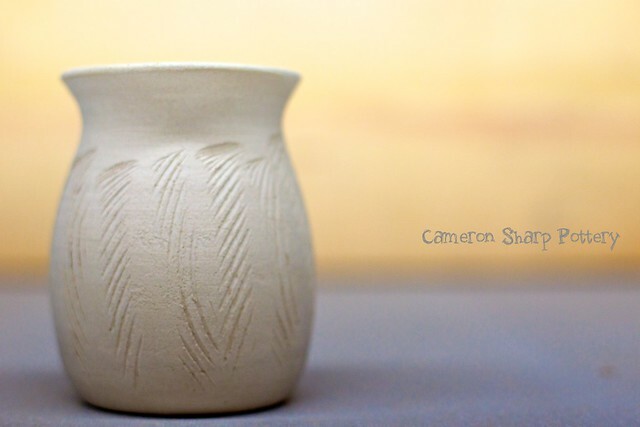 I really enjoyed reading his book called Throwing Pots back when I started my clay journey. So check out the film and the links and let me know what you feel. I’ve added Goodreads on the bottom right so I can share what books I have read or want to read. If you have read some great pottery books please recommend them to me. Emerging artist. emerging artist? emergency artist? emerging from what? from where? What is an emerging artist? I guess it means becoming known on the scene. I like this idea of always beginning. Each pot is a new beginning, each session of kneading is a new beginning, and each washing up. A beginner is always searching and learning something new by doing it. Theory can get your mind going but really, doing it is where the learning begins. There are so many forms I want to make. It is endless. I want to make and sell pots that people can buy and use. I’m more attracted to green than blue, more to red and brown than purple, orange and black to me are better than pastel anything. I like creamy milky satiny white and yellows. I like transparent jade greens and deep translucent emeralds more than muted olive green. I like browns. I like reds that are warm and irony more than reds with blue. I want to make pots that look as if they just took a breath of fresh life, and glaze them in such a way that maintains fluidity like water. Ok so I am emerging. I am emerging from an old tired career that was suppose to be a means to an end and somehow has become what I do and have done for far too long. When you do something for so long it gets routine and boring. It is not the beginner’s experience. I want very much to start fresh like a spring flower and bloom in the sunshine of newness and learning. An experience of trying something new every day is invigorating and challenging, encouraging me to resist judgment and frustration with a gentle intention of freedom, forgiveness and fun. If it is not fun why do it. Warren Mackenzie says that making pots ought to be fun. I’m with him. I want to have fun and enjoy what I do. It will not be easy and it will be a long road. The road is long anyway so making pots has just as much of a chance for me than anything else. More of a chance because I love doing it. I’ve been there and done that, and there and that don’t appeal to me anymore. I want here and this instead. ooh I like! Been there done that, now I want to be here and do this. I made a little piece of music the other night on my computer and found myself enjoying the first 20 minutes and then it became something else. Something I did not enjoy, something that was trying to be something it was not. It became a searching and sifting through process instead of a creating one. My process of songwriting used to be free and flowing until I involved a computer and production. Even when it sounds cool or hip or funky etc. it sounds like everything else. When I used to just sing to write the song, it was more real and unique and more human and less machine. I think making pots needs to be this way as well, fast and free. To spend too much time on a single pot can take all the life out of it. I want to always improve my throwing skills so I can let it all go and just make pots, like an actor rehearses lines, memorizes blocking, studies the scene and then lets it all go for the performance trusting that the work has been done. It is like that with making pots. Learn technique first and then let it go to be free and trust that the time spent on the basics will always be there for me to tap into. This winter sunshine is a gift. It’s helping to dry out my clay chunks so I can slake them down. It’s keeping my glazes from freezing and feels good on my face. I’m filled with gratitude for everything that has led me to this moment. All the ups and downs are part of the journey and this moment is where I want to be doing this.